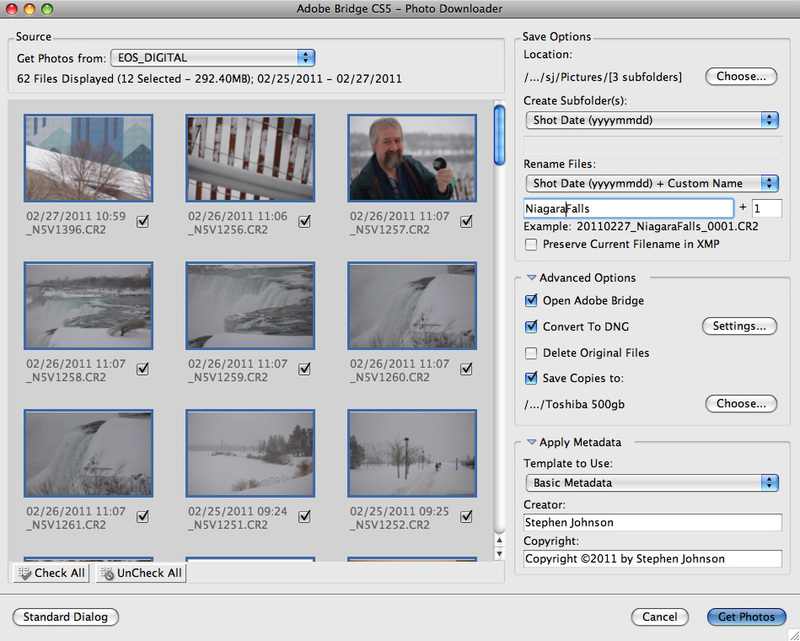 Using Adobe Bridge PhotoDownloader or Lightroom's Import download feature empowers photographers to take care of critical matters right up front. Location: choose the location to offload the files. Create Subfolder: Auto Folder Name Generation create and name custom folders according to what makes sense to you. I use year, month, day. Rename Files: Custom naming, instead of using the arbitrary photo names coming out of the camera, custom name your photos on download to something that makes sense to you for easily find later. I use the same naming protocol as the folder name, with the added custom text identifying the place. Convert to DNG: option to convert your files on download from the proprietary camera format to Adobe's documented DNG (digital negative) format. Save Copies to: Back up Copy as a basic safety measure, simultaneously back up your files to a second drive as you offload. Apply Metadata: add your name, copyright and contact information, all on download. Make custom Metadata Templates that contain all of this information always ready to apply to your photographs.